To be used as a surface spray, standard dilution rate: 15g Ficam® W in 5 litres of water. Ficam W is recommended for the control of cockroaches, ants, fleas, flies, adult mosquitoes, bed bugs, carpet pests, moths, silverfish and other bristle tails, firebrats, beetles, earwigs, crickets, booklice, spiders, woodlice, centipedes, millipedes, ticks and thrips. For use in domestic premises and in animal husbandry situations such as livestock barns and small animal houses e.g. Dog kennels and slaughter houses. Not for use in catteries or where cats are enclosed in a cage/carrier. Not to be applied in the presence of livestock/animals. For use in continuously occupied areas as a band/spot or crack and crevice treatment only. Ficam W can also be used outdoors at refuse tips and sewage works (not for use on sewage works filter beds). Application can be to hard porous and non-porous surfaces, hard furnishings, and soft furnishings (including mattresses,) not for use on clothing or bedding. Professional Use Only, in purchasing this product you undertake that it will be applied by a suitably trained professional operator. Ensure that sprayer is clean and free of oily residues. If necessary wash out the sprayer with water and detergent before use. Fill the sprayer with the required volume of water. Add the required quantity of Ficam W. Close the sprayer and shake before use. Re-shake after periods of rest. Apply as a coarse spray. For treatment of exposed surfaces use a flat-fan nozzle with an output of 0.5 – 0.7 litre per minute. Such nozzles are normally marked 8002 or 02F80. To spray a single band e.g. at wall/floor junctions hold the nozzle approximately 0.5 metre from the surface to be sprayed and spray at a speed of 0.5 metre per second. This will produce a sprayed band 0.8 metre wide. To spray large areas of surface e.g. carpets, proceed as above but spray overlapping bands 0.5 metre apart. This will ensure an even coverage of spray. To spray cracks and crevices, use a pin-stream nozzle or special crack and crevice extension. Sprayed Surfaces : Ficam W sprays can be applied to any surface which is not damaged by water alone. Ficam W will remain active for many weeks at the normal rate and greater residuality will be achieved at the special rate. The residual life of the deposit will vary depending upon the cleanliness and nature of the surface to which it is applied. Therefore re-treat as necessary. Ficam W treated premises can be re-occupied by children, pets and other animals once the sprayed surfaces are dry. Cockroaches: Use one (50 ml = 15 g) measure in 5 litres of water. Spray hiding, runway and scavenging areas paying particular attention to cracks and crevices and areas behind or under machinery, kitchen equipment or pipework, which are usual cockroach harbourages. In situations where very heavy cockroach infestations are present, where an extended period of control is required, e.g. ships and aircraft, or where conditions are particularly unhygienic, use two (2 x 50 ml = 30 g) measures in 5 litres of water. 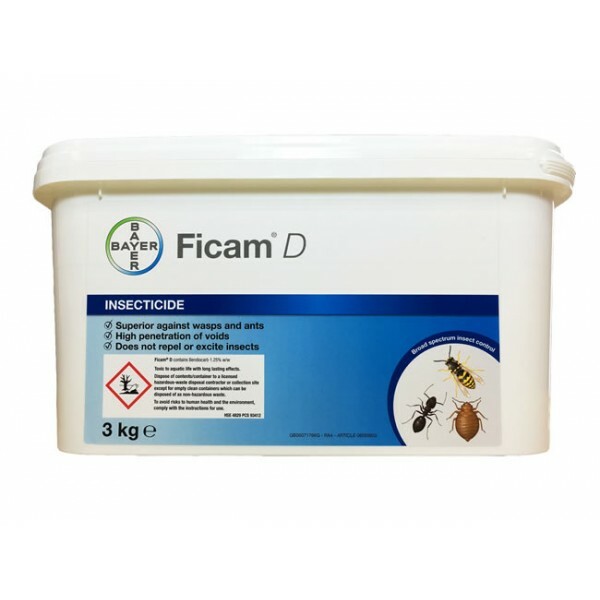 For complete eradication of infestations, it is essential to conduct spray treatment with Ficam W in conjunction with treatment of inaccessible areas such as service ducts and roof voids with a suitable insecticidal dust such as Ficam D.
Ants: Use one (50 ml = 15 g) measure in 5 litres of water. Spray in and around nests, runs and foraging areas. A barrier spray of Ficam W around buildings, paying particular attention to doors, windows and other entry points, will prevent entry of foraging ants from outside. Fleas: Use one (50 ml = 15 g) measure in 5 litres of water. Spray floor coverings and furniture particularly in areas likely to be infested including sleeping areas of dogs and cats but not directly on people, animals or bedding. Flies: Use one (50 ml = 15 g) measure in 5 litres of water. Add 50 g of sugar and stir to dissolve. Identify where flies settle and spray the surface. The sugar acts as a bait encouraging flies to remain on the treated surface long enough to pick up a lethal dose of insecticide. Bed Bugs:Use one (50 ml = 15 g) measure in 5 litres of water. Spray bed frames and mattresses and cracks and crevices in adjacent wall and floor areas. Do not spray bed linen or other materials which come into direct contact with occupants of the bed. Wasps and Wild Bees: Use one (50 ml = 15 g) measure in 5 litres of water. Spray nest entrances and surrounding areas thoroughly.